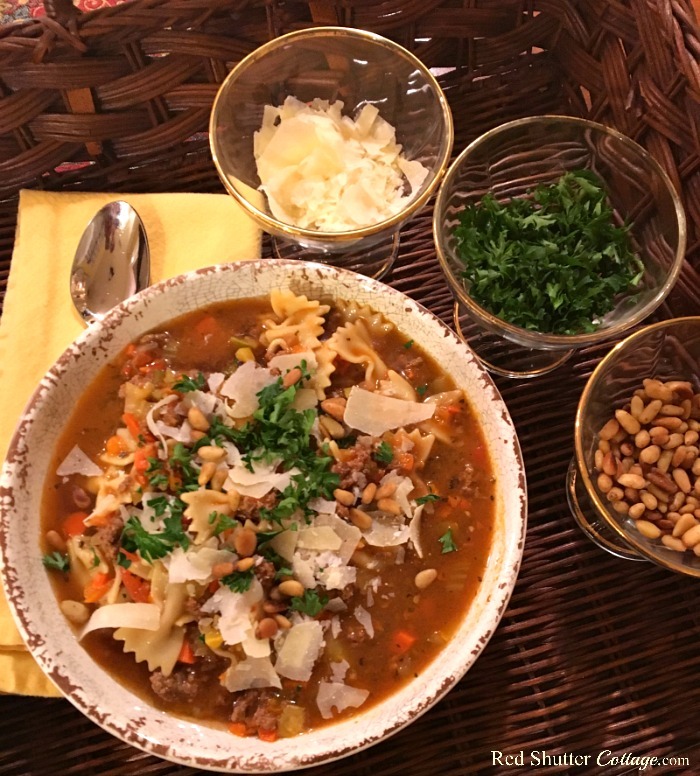 At this time of the year, at the height of the holiday season, soups, stews and chilis start to appear on my meal plans in a big way! 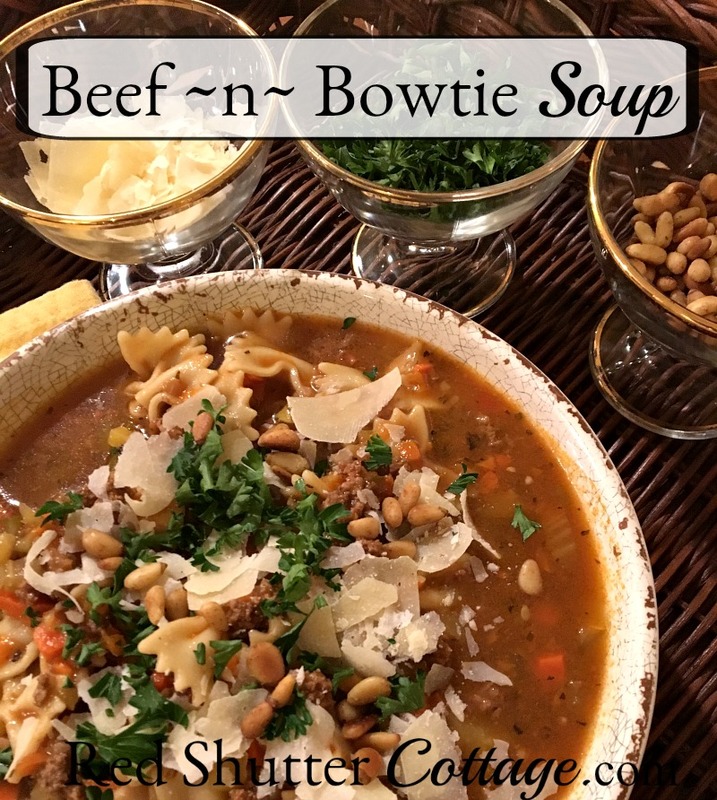 I occasionally make this recipe for Beef ~n~ Bowtie Soup in the spring and summer months. But during the fall and winter months, when hearty and flavorful is a priority, it is an especially welcome meal! Like most soups, this recipe is versatile and flexible. You can add, take out, or swap out as you please. It’s very basic, no special ingredients, so if your pantry is stocked, it can be made on a whim. For example, you don’t need to add the ground beef at all. If you want, you can use chicken instead. If you do, I would recommend using chicken stock in place of the beef stock or Better the Bouillon (which tastes amazing, by the way!). Instead of ground beef, you could use beef stew meat. Or if you prefer, leave the meat out entirely! For the herbs and seasonings, you can swap out or include, rosemary, thyme, or oregano. Instead of a can of tomato sauce, I will sometimes add in a can of tomato soup. Personally, I am not a fan of a pot of boiling water on my stove, especially when there is a big pot of soup on. Instead of cooking pasta on my stove top, I cook it in the microwave. I have a wonderful tool called “Fasta Pasta”. It’s a plastic box, slightly smaller than a shoe box, and includes a lid. It comes with directions on how to cook any and all varieties of pasta. It is efficient, easy and a very quick clean-up. You can buy it on Amazon; here is the link. (Please note – I am not an Amazon affiliate.) I really cannot recommend it enough! In the recipe notes (and the pictures) I list parmesan cheese, parsley and toasted pine nuts as toppings. Other options include sour cream, shredded cheddar cheese, diced onions, or salad croutons. This soup freezes well too. I often make a double batch, and freeze additional servings in 4-cup containers. It’s especially helpful for those “I don’t have anything planned for dinner” nights. I hope this recipe finds it’s way into your meal planning schedule. It’s easy, versatile, and can be adjusted in so many ways. Be sure to make enough so that you have leftovers on those nights when you need something quick and delicious! 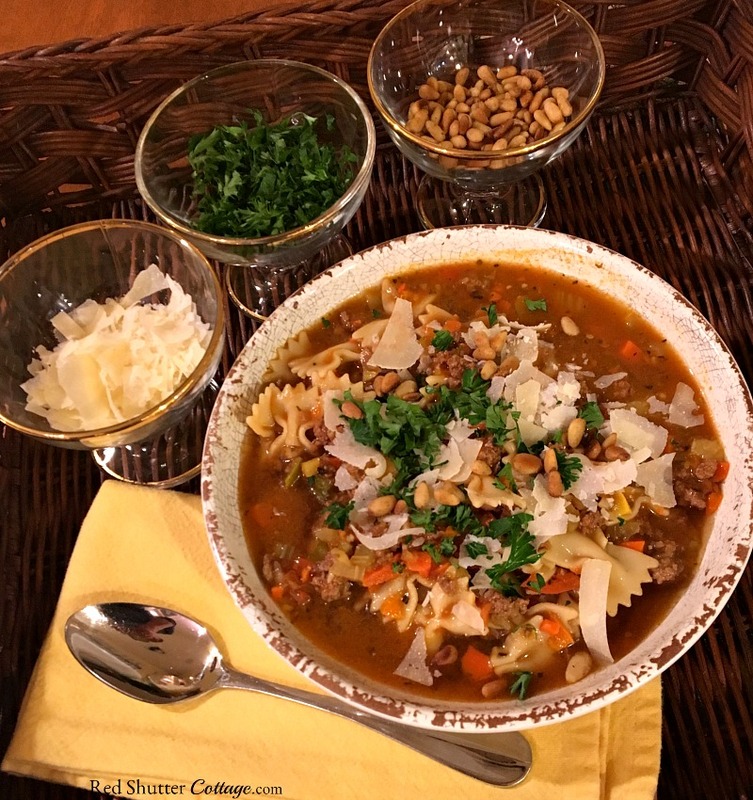 (This recipe is adapted from Zesty Hamburger Soup for Slow Cooker Saturdays, by Cravings of a Lunatic.) 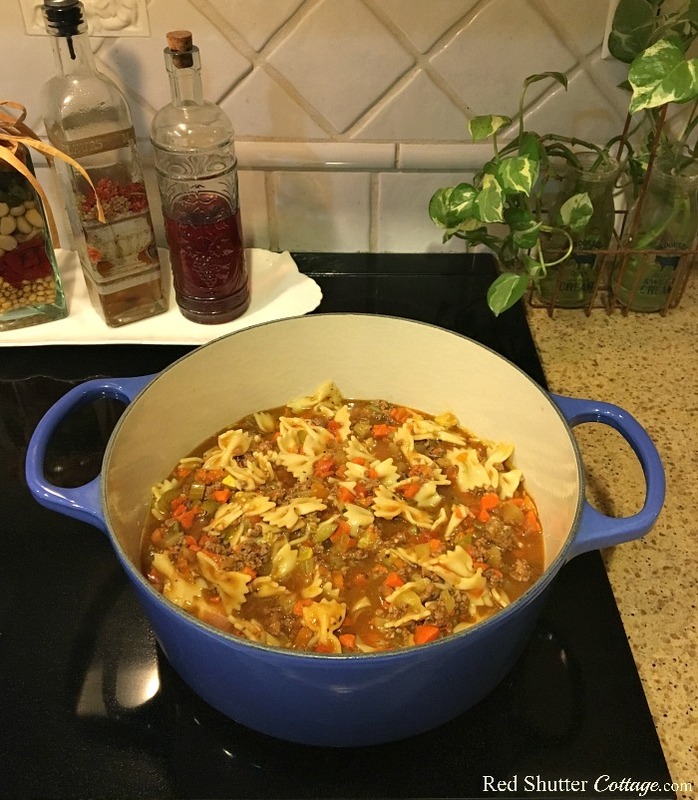 For more ideas and recipes for winter comfort food, click here and here! 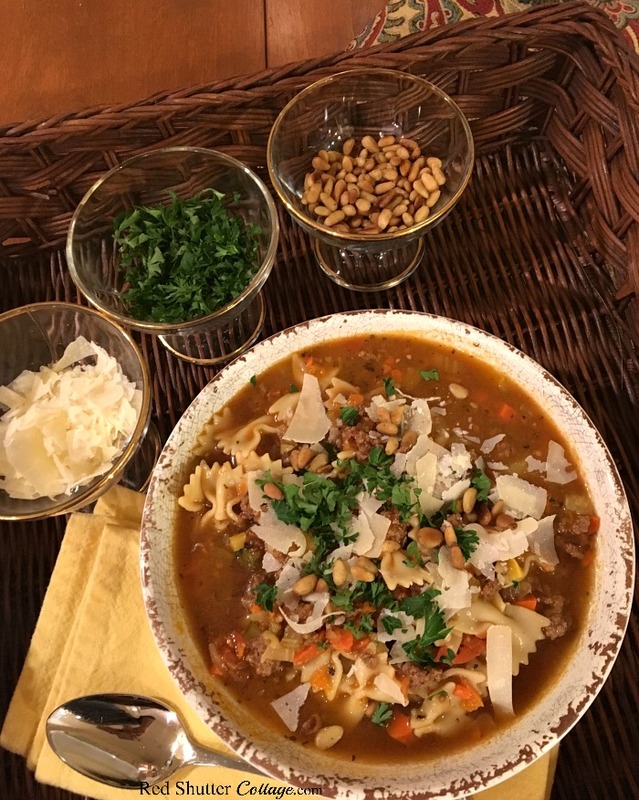 A healthy, nutritious and versatile soup that can be adjusted easily, and freezes well. Optional: Chop up 2-3 cups of various vegetables: mushrooms, red, green or orange peppers, zucchini, summer squash, cauliflower, broccoli. Toppings: Parmesan cheese, parsley, toasted pine nuts. #1: Using a stock pot or a 5-quart Dutch oven, heat the olive oil over medium heat. Add the chopped onion and garlic and sauté 4-5 minutes. #2: Start cooking the pasta, but do not cook it fully. You will be adding the pasta to the soup as the last step, and it will cook a little bit more in the soup. #2: Turn the heat up and add the grown beef. Stir and cook until nearly fully cooked. #3: Add the vegetables - carrot and celery. If you decide to include the optional vegetables, add them at this point also. #4: Continue cooking on higher heat until meat is fully cooked, and vegetables are sautéed. #5: Add the liquids: the 4 cups of Better than Bouillon, the can of diced tomatoes, and the can of tomato sauce. Add the seasonings: the herbs, bay leaf, and brown sugar. Add salt & pepper to taste and stir everything together. #6: Lower heat put on the lid, and let the soup sit on the stove for a few hours, if time allows. Stir occasionally. This looks delicious! 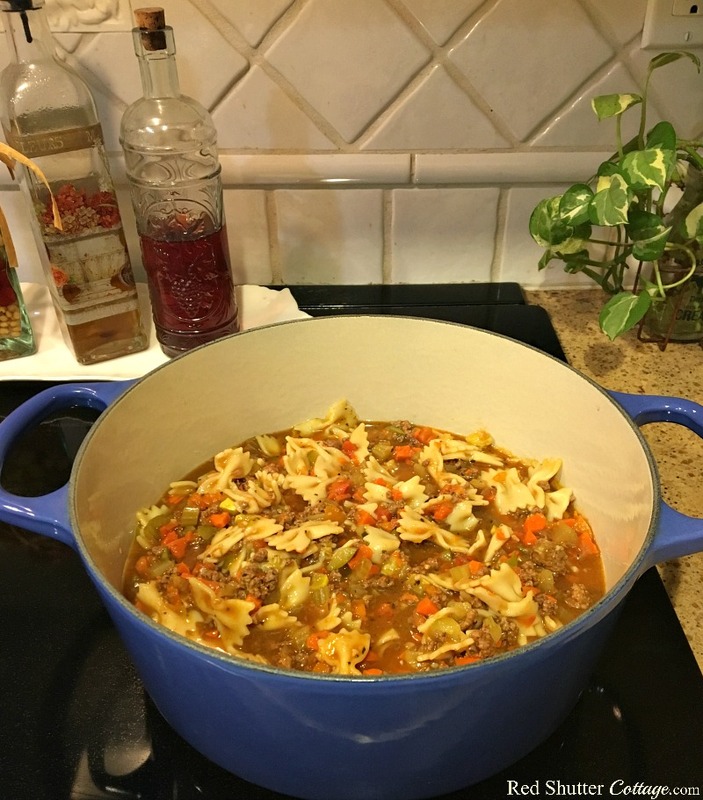 My kids are big soup fans so I am always looking for recipes they will love! 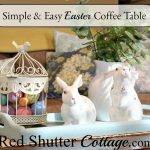 Shelley – I hope they like it! Try it with some fun pasta shapes-my younger stepson used to love wagon wheels! Thank you for stopping by!